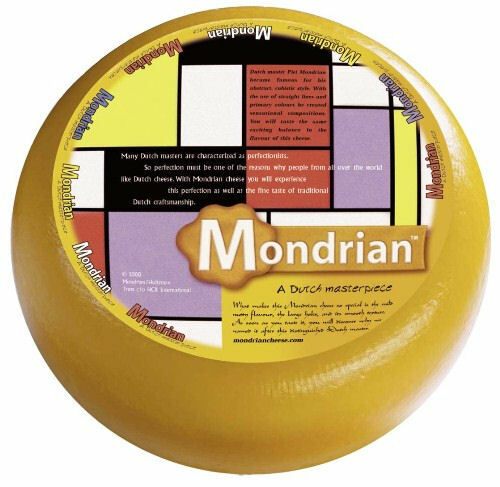 The number of Mondrian food items, recently boosted by the Mondrian Sandwich, now justifies a separate page and so has been split off from Mondrian Misc. Regarding what Mondrian himself ate, this is covered in as much detail as I have found here. A red circle o means the item is in my collection, a blue circle o denotes an image from the collection of a contact in Holland: contributions of images from other Mondriaphiles are always welcome. 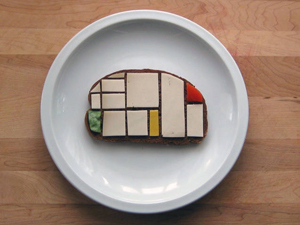 This is Brittany Powell Parich's beautiful and carefully considered Mondrian sandwich. Yes there is green (and Brittany warned of reaction thereto), but consider this. 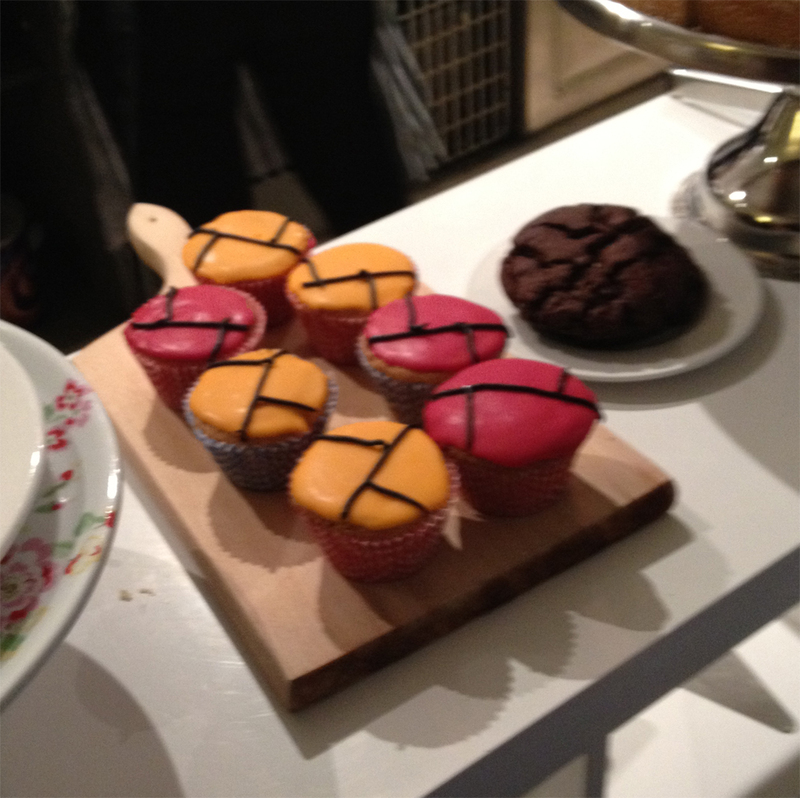 The Courtaulds cafe at the recent MONDRIAN || NICHOLSON: IN PARALLEL show entered into the spirit of the event by creating Mondrian Muffins. from San Francisco Art Magazine Com, but the link I had is dead. 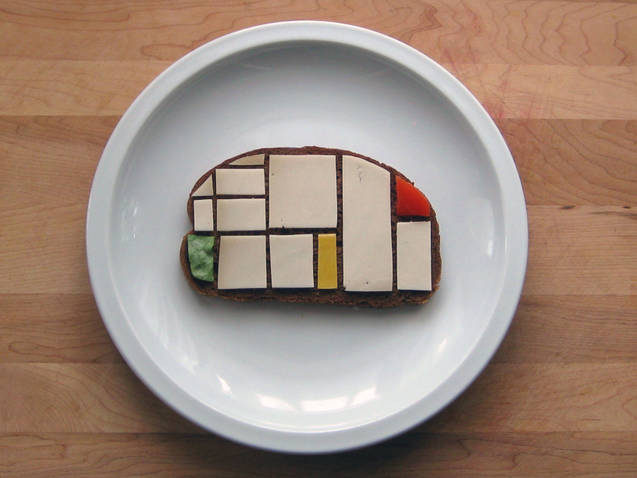 And in the spirit of April Fool's, you can see how SFAM gets fooled in our cover story Red Wine and High Heels, an evening with the Post Mondrian Collection. 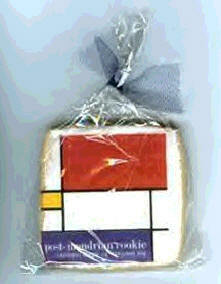 How could anyone resist a show with party favors like the non-Internet cookie. I did have some correspondence with the person who wrote the article in an effort to get hold of a slice, but there were none spare and the writer would not part with hers (not that I expected her to). 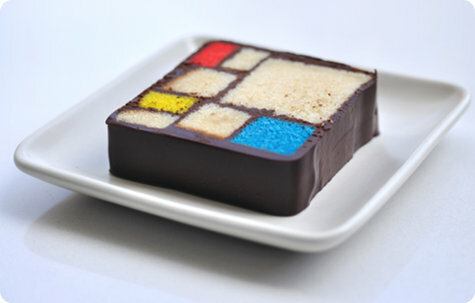 [14th Oct 2011] Mondrian Battenburgs and other cakes are now commonplace: here's one from an interesting page of art-inspired cakeage. Not sure why these aren't filed under eating.